The plan includes a Dodd-Frank study requirement but no efforts to block PPACA. (Bloomberg) — House and Senate lawmakers agreed to a bipartisan compromise to fund the U.S. government through Sept. 30, unveiling the measure days before financing for federal agencies is scheduled to lapse. The $1.1 trillion measure, H.R. 3547, includes $1.01 trillion for U.S. government operations, plus war financing known as overseas combat operations. Republican efforts to derail some regulatory initiatives and to deny funding for implementation of the Patient Protection and Affordable Care Act (PPACA) were left out to ensure passage and avoid a repeat of the 16-day partial government shutdown in October. 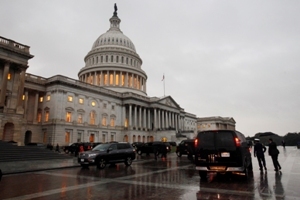 The bill, announced last night by lawmakers including House Appropriations Committee Chairman Hal Rogers, a Kentucky Republican, and Senate Appropriations Chairman Barbara Mikulski, a Maryland Democrat, probably will reach the House floor tomorrow, Rogers said. Negotiators had agreed on a $1.01 trillion base spending level in December as part of a two-year, bipartisan budget agreement. The spending measure unveiled late yesterday would support defense spending at about $573 billion for the current fiscal year, with $85.2 billion for overseas combat operations in Afghanistan, about $2 billion less than in fiscal year 2013. The bill “represents a positive step forward for the nation and our economy,” Sylvia Mathews Burwell, director of the White House Office of Management and Budget, said in a statement. President Barack Obama’s administration “urges Congress to move quickly to pass it,” she said. Government funding runs through tomorrow, so lawmakers plan to pass a separate three-day bill at current funding levels to push the deadline to Jan. 18. That would give lawmakers enough time to enact the comprehensive legislation without risking a government shutdown. The House plans to vote on the stopgap measure today. The Senate plans to take up and pass the short-term extension once the House completes action. Any senator could delay passage of either measure for about four days, though no senators have said they will do so. In October, when the government shut down, efforts to thwart PPACA were at the center of the funding bill fight. This time around, “there is nothing in the bill that blocks Obamacare,” Mikulski said. “We tried to keep those political riders out,” said Richard Shelby of Alabama, the top Senate Republican appropriator. Even so, Republicans were able to place several provisions they’ve sought into the final measure. The Office of Management and Budget would have to study the cost of implementing Wall Street regulatory changes mandated by the Dodd-Frank Act. Lawmakers preserved language that would block federal funding for abortions, and they kept language that would prevent Washington, D.C., from spending any money to legalize marijuana. Another provision would keep Vice President Joe Biden and other senior officials from getting a pay raise. The spending bill would fund the Securities and Exchange Commission at $1.35 billion, or $324 million less than the SEC sought for 2014. The bill would cut $25 million from a reserve fund that pays for the agency’s big technology projects while mandating the SEC spend $44 million on economic analysis. While Congress approves how much the SEC can spend, the agency’s budget is fully offset by fees imposed on securities transactions. The measure gives the Internal Revenue Service $11.3 billion, leaving the agency’s budget little changed and finding a middle ground between a reduction of more than $2 billion sought by House Republicans and an increase of more than $1 billion sought by Obama. The bill bars the IRS from targeting groups based on their ideological beliefs, in response to the agency’s scrutiny of Tea Party groups seeking nonprofit status. It doesn’t include Republican-backed limits on PPACA implementation projects. Mikulski said the bill includes a “fix” for a recent reduction in benefits for veterans’ survivors and for disabled veterans of working age. The benefits were cut in December.